Big Pit: National Coal Museum Industrial HeritageBig Pit was a working coalmine until it closed in 1980. Then in 1983 it became a museum of the South Wales mining industry and on February 1st 2001 became incorporated into the National Museum and Galleries of Wales as the National Mining Museum of Wales. Now it stands high on the bracken-clad moors of north Gwent importing visitors instead of exporting coal. The highlight of the visit is the hour-long underground tour, led by ex-miners, which takes you down in the pit cage to walk through underground roadways, air doors stables and engine houses built by generations of mineworkers. 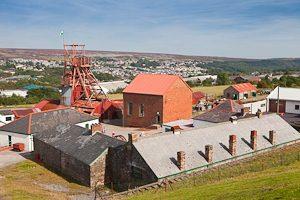 An award-winning national museum that still retains many traits of its former role as a coal mine, standing high on the heather-clad moors of Blaenafon. Open daily 09:30 - 16:30; last admission 15:30. Underground tours run 10:00 - 15:00 (tours may be suspended at busy periods). Buses run from Newport daily (Monday to Saturday) number X30. Bus times from Newport: 8.45 am; 10.45 am; 12.45 pm ; 2.45 pm. Return bus, leaving Big Pit: 10.55 am; 12.55 pm; 2.55 pm; 4.55 pm.